Apparently a dramatic world chess championship blows up my twitter feed. That might tell you something about me or twitter or both, but probably nothing you didn’t already know. In the recent championship a pair of 27 year olds played to a 6-6 tie, pushing the contest to (I kid you not) a speed round. Defending champion Magnus Carlsen appeared to be on the ropes against the crafty Russian in a final, 25 minute match. Then the internet lit up. Every post included six cryptic characters: Qh6+!! Magnus Carlsen not only won, but had won in startlingly sublime fashion. Everyone agreed. I stared at the final board, sure he’d given the game away. He slid an unprotected Queen into a space where his opponent could easily take her…two different, and apparently costless, ways. Now, I was once a competent recreational chess player. I was never in the tournament “scene” but I was undefeated in my high school chess club senior year, including a “celebrated” win against a teacher. I once got a parking ticket in front of the Watertown public library because I lost track of time reading a book on chess openings. My nerd cred is pretty tight. But as I starred at winning move, I only saw a colossal blunder. I knew it wasn’t. The Russian conceded before Magnus took his hand off the move. The masters saw something I didn’t. To me, the decisive blow that ensured victory - the creative stroke that blew up (a particularly nerdy corner of) the internet - looked like an error my 5 year old committed in his first game. Duh, the pawn can take the queen. Or the king for that matter. Not only did I see a senseless queen sacrifice, I saw impending defeat. The Russian was just one move away from his own victory. He simply needs to slide that rook-backed Queen one space to clinch the match. Karjakin threatened no less than four checkmates, and there’s no way Carlsen could have sidestepped them all. 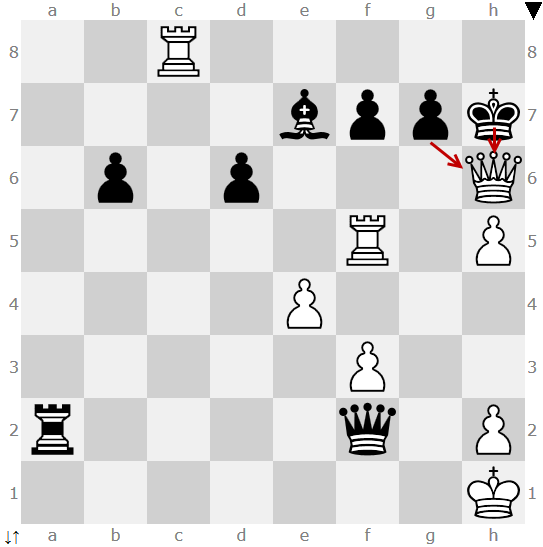 The only problem for the Russian: It was Carlsen’s move. I had to set up the board and work scenarios for maybe 8 minutes to figure out how Qh6+!! won the game. To my amateur eye, the master stroke that ensured victory looked like a colossal blunder. A couple weeks later it occurred to me: the first Christmas was like Qh6. God’s decisive victory presents as weakness. Like the queen sacrifice, the incarnation is such a heedless invasion of enemy territory, such a reckless act of regal self-donation, that at first glance it looks foolish. The sheer scale of the apparent error might mystify casual onlookers, God going all in on an infant incarnation. But those who understood, the angels and the shepherds, messengers cosmic and very very terrestrial, wizards walking west and eccentric temple hermits, those who saw it for what it was, nodded knowingly. They gasped, not with horror, but with delight. They saw the victory secured. God’s plan for human redemption, wrapped in poo soiled swaddles, under the shadow of Roman oppression, into the mess of our ingenuity for injury, looks like a colossal blunder…like Qh6. It is a bold royal invasion, but it leaves the Prince of Peace vulnerable and exposed and unprotected. And we know how the story goes. The move requires royal sacrifice. It ends with self-donation. Except that’s not how it actually ends. Christmas is a master stroke, so startling and sublime that it looked like defeat…until it didn’t. The angels and shepherds gasp at its beauty and brilliance. And in the fleeting moments, amidst the falling leaves and downtown lights, when the story behind the story behind the story of Christmas really dawns on me...so do I. This post was written while listening to Through The Deep, Dark Valley by The Oh Hellos. The best chess name ever. Seriously, the whole internet, maybe you were doing something else at that exact moment. I played soccer in the fall and ran track in the spring and used to tell people chess is my winter sport. Can you believe the founder and president of the chess club had a social calendar that afforded him time to read chess books? He only had 10 second, he was down to the incremental move time which was 10 seconds a move. He needed none of them. 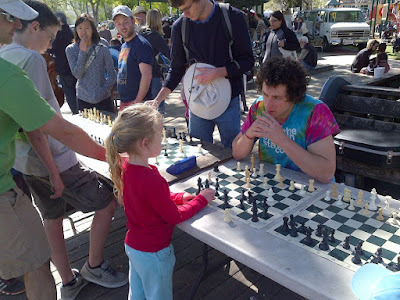 The UC Davis chess club sometimes sets up boards during the farmer’s market, which is just one of the many delightful things about my town. They taught me my favorite strategy for playing chess with children (without throwing the game, which I just can’t do…not just morally – it models bad chess and undermines the pedagogy). They played for a little while, until the expert had a clear advantage, and then, switched sides and played some more until the other side gained an advantage, and then switched again. The final switch came when the expert was within a few moves of check mate, and could coach the beginner through it. *Speaking of mating chess pieces (a clause that has never been written and never should have been), my buddy and I tried a variant of chess in high school where both knights (horses) from one color could occupy the same space, which we called a “breeding” move. A certain number of moves later, that space sprouted a new knight. During a @steveluxa advent sermon. He laid out a couple evocative illustrations of the incarnation, and it got me thinking of this one. Theological pun…I’m hilarious. Turns out puns about the incarnation flirt a little with heresy…but then again, words about the incarnation flirt a little with heresy, that’s the nature of mind bending mystery. The Slate article describes the move as a “gift” Magnus gave us. I love that. This is actually one of the reasons I follow sport. It is genre art. Each event is a collaborative making. Some are tedious or lop sided. But each holds the potential for transcendence. Labels: advent, Chess, Christmas, Incarnation, Qh6! !